A number of Muslims under take religious journeys every year to the graves of certain pious people, in order to perform acts of worship at these graves. These people normally do these acts of worship at these graves believing they will get more reward for these acts of worship. However religious journeys to graves are prohibited. This hadeeth indicates that a Muslim should not undertake any religious journey which involves visiting a place [due to the status of that place] except for the above three mentioned places. Other places such as the graves of the righteous have not been given any special status by Allaah or his prophet therefore they must not be travel to. Moreover it is not allowed to make any grave even the prophet's grave a place that is visited at a known set time every year, month, week or daily. The word Eid in the Arabic language refers to something that keeps reoccurring at certain known set times. Therefore what is meant by the prophet's statement is that a Muslim must not take his (the prophet's) grave or any other grave as a place that is visited at known set times whether it be yearly monthly, weekly or daily. Some Muslims write directly on to the graves or the put things on the graves which have writing on them. Some Muslims write messages or verses of the Qur'an on the graves. The hadeeth above shows that writing anything on the grave is forbidden so is plastering the walls of the graves. Plastering the walls of the grave refer to putting things on the graves such a piece of metal for example with the persons name on or something similar on it. Connected to this issue is the issue of putting followers and lights (candles or normal lights), and other things on or around the graves. This practice of putting things around or on the graves was not ever done by the prophet or his companions so it should not be done today by Muslims. Plus it is feared that if Muslims do this then over time others may want to beautify the grave even more by building structures over the grave, which is not allowed. Also Muslims are not allowed to pray towards the graves or sit on them. Praying towards a grave could eventually lead a person into a far greater sin. It could lead to a person praying to the person in the grave, which is Shirk al-Akbar. Additionally sitting on the grave is showing disrespect to the person inside the grave. Unfortunately some Muslims build mosques over graves of pious individuals but this practice has been forbidden by the prophet Mohammed, sall'Allahu alayhi wasalam. From this hadeeth it is clear that people in the time of the prophet, sall'Allahu alayhi wasalam used to also build mosques over the graves of there pious people and the prophet, sall'Allahu alayhi wasalam did not agree with what they did. In fact he called them the worst of the whole creation in the sight of Allah. Moreover Imam al-Nawawee ruled that whatever mosques had been built over the graves should be torn down. Plus the prophet, sall'Allahu alayhi wasalam prohibited building any sort of construction over graves. 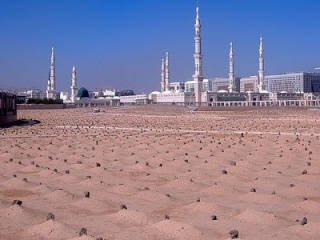 Graves are supposed to be hand span high however some of today’s Muslims build graves much higher than this, not knowing that the prophet,sall'Allahu alayhi wasalam commanded his companions to destroy any graves higher than a hand span. Imam al-Nawawee in his sharh Saheeh Muslim said: “The sunnah is that the grave not be raised up a lot above the earth['s surface], nor rounded, but that it be raised up approximately a hand-span (shibr) and flattened, and this is the madhhab of al-Shafi'i and those [of the other schools] who agreed with him, while al-Qadi Iyad related that most of the Ulema prefer it to be rounded [in the shape of a mound], and this is the madhab of Imam Maalik. Furthermore worshiping Allaah at the graves is not allowed because, worshiping Allaah at the graves turns the grave in to a mosque (a place of worship). In these two hadeeths the prophet, sall'allahu alayhi wasalam explicitly informs Muslims that it is prohibited to take graves as mosque (a place of worship) and he informs them that due to the Jews and Christians taking the graves of their prophets as mosques, Allaah has cursed them. Additionally these two hadeeth highlight the most important thing a Muslim must understand is du’aa to the righteous or using them as intermediates between themselves and Allaah is not allowed. However if the pious dead Muslims are called upon at the graves this is even more hated. So for example if a Muslims says “O so and so in the grave can you help me” or “O so and so in the grave I call on upon you, so that you can take my du’aa to Allaah” at the graveside. The reason for this is if it is forbidden to worship (make du’aa to Allaah) Allaah at a grave then it must be even worst to worship (make du’aa to) other than Allaah at a grave. Recorded by Bukhari and Muslim. This is why in Islam we have two Eids as they occur at the same time every year either after Ramadan or Hajj. A companion was a person, who meet the prophet Mohammed, believed in him and died with that believe. Shirk al-Akbar is when a person worships other than Allaah for example, a man who prays to a dead person. Recorded by Bukhari, Muslim and Nasaa’ee. Imam Ahmeds book of hadeeth. This is the Arabic word for explanation. A madhab is a school of Islamic law which was founded by one of the early scholars of Islam. Most madhabs died out. The most famous and still in use are the Hanafi [Imam Abu Hanifah], Maalaki [founder Imam Maalik], Shafi [founder Imam Shafi] and Hanbali [founder Imam Ahmed] madhabs. Recorded by Bukhari, Muslim, Ahmad, and an-Nasaa’ee.